Summary: It’s a hockey night in Wheeling! 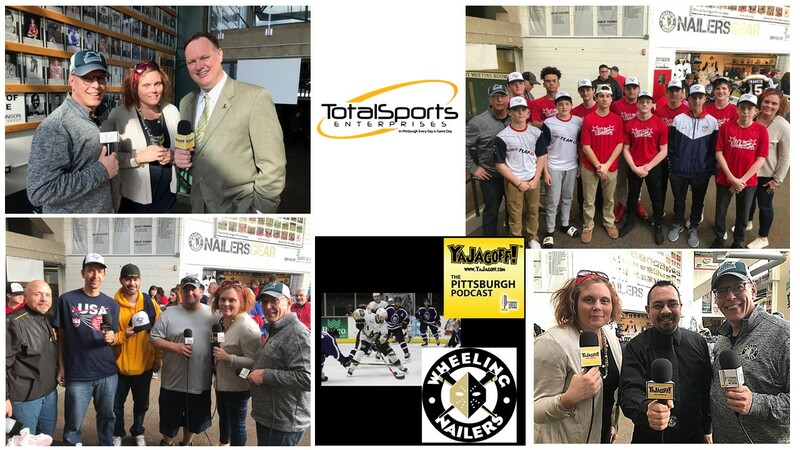 John and Rachael are on a road trip with 119 of their closest friends to celebrate one of the final Wheeling Nailers games before playoffs AND commemorate the Team Pittsburgh players selected to play for Team USA in Europe. We chat playoff hockey and minor league recognition with the Nailers coach, Jeff Christian, DJ Abisalih, DJ extraordinaire, who wears multiple hats including acting as the Mike Lange of the Nailers, gives some play-by-play fave lines, and apparel guru, Matt Allietta who broke away from his busy store to talk Nailers notoriety in the city. Then, we discuss the journey to Europe for the World Ball Hockey Tournament this June with the Team Pitt crew, where we find out who has the loudest cheering hockey momma. Listen to the podcast recording by clicking the play button below. If you don’t see the play bar above, in your email, CLICK HERE, to listen to the podcast while you work, walk your dog, clean your parakeet cage or rest. 01:12 What was on the blog? This is Us and alcohol are neck and neck in the Jagoff March Madness brackets—which sitch will be the reason people become jagoffs? Also John and Rachael prepare for the big benefit concert Saturday with Johnny Angel and the Halos for the Team Pitt kids representing Team USA in Czech! Saturday, April 7 at West View Firemen’s Hall with doors opening at 6:30. includes desserts, beer, snacks and concert! QUESTION OF THE DAY: It’s a hockey kinda episode, so who is your hockey hero or inspiration and why? 04:26 Jeff Christian name drops some of the most notable players in the NHL who he played with or worked with, helping land his coaching role. The Ontario-born coach roomed with Billy Guerin and even had a short stint with the Pens in the 90’s. He has some inspirational hockey quotes for perseverance! The Team Ryan Charitable Foundation, founded by Coach Christian and his wife Dorie, in memory of their daughter Ryan can be found here: www.teamryanfoundation.org. 34:25 Team Pitt Coaches: Dave O’Malley, Eric Pazkowski, Justin Salinetro and Wil Rennebeck explain the evolution of Team Pittsburgh at every age level thanks to the support of the city and coaches who have made Team Pitt a force to be reckoned with. In fact, now the dek hockey organization is sending 11 players to Europe this summer just in the Under 14 and Under 16 divisions after a year of grueling tryouts among the best players from Philadelphia, New Jersey, Chicago, and Boston to name a few cities. 44:33 Team USA players: They are pumped and ready for Europe this summer! These 11 kids are representing Pittsburgh but even more the USA as the best of the best in their age groups. They brought over 100 people to support them at the Wheeling Nailers game where they sold and reaped the benefits of the chuck-a-puck fundraiser, plus were recognized throughout the night. Find out who controls the tunes and who has the loudest mom…errrrr cheering mom? Closing… thanks to all who came out to the game and podcast.